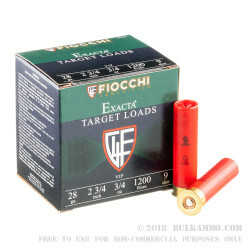 These Fiocchi clay loads for your 28 gauge shotgun deliver excellent performance at a reasonable cost. 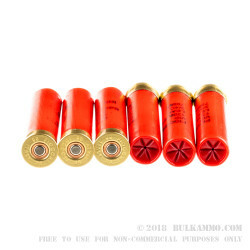 Each shell in this box of 25 fires a 3/4 oz. column of #9 shot at a muzzle velocity of 1,200 feet per second. Expect good patterning, solid claybusting performance, and mild recoil--all in keeping with the usual performance of the 28 gauge. 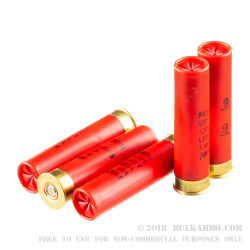 Like many Fiocchi products sold in the US, these shotshells are loaded in Ozark, Missouri. 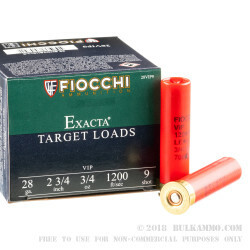 Fiocchi is an Italian manufacturer that has operated since the 1870s and has gained a strong following in the US since entering the American market in the 1980s thanks to the quality and affordability of its ammo.